Resolved by the House of Representatives (the Senate concurring), That there be printed of the eulogies delivered in Congress upon Hon. 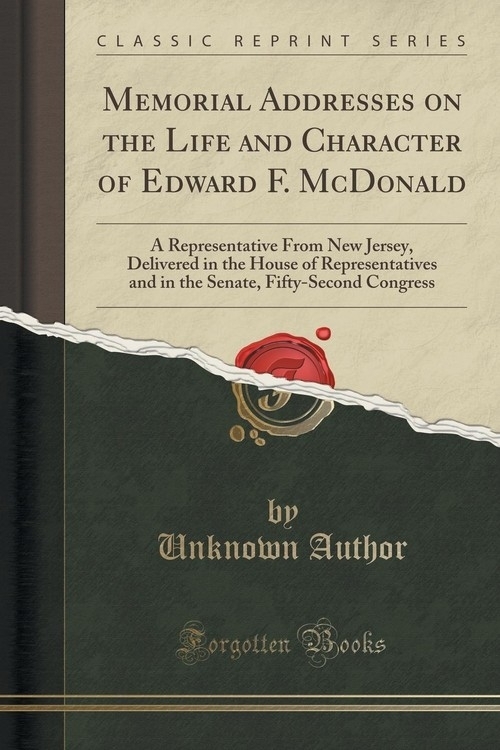 Edward F. McDonald, late a Representative from the State of New Jersey, 8,000 copies, of which 2,000 copies shall be delivered to the Senators and Representatives of the State of New Jersey, and of those remaining 2,000 copies shall be for the use of the Senate and 4,000 copies for the use of the House; and the Secretary of the Treasury be, and he is hereby, directed to have printed a portrait of said Edward F. McDonald to accompany said eulogies. That of the quota of the House the Public Printer shall set apart 50 copies, which he shall have bound in full morocco with gilt edges, the same to be delivered, when completed, to the family of the deceased. Agreed to in the House of Representatives, February 18, 1893. Agreed to in the Senate, February 24, 1893.